Went swimming this morning, and hoping to go again in a few minutes. Yummy day. Just glorious. Signed and drove to Richford, Vermont to mail a few books. Did some food shopping. Then home for the swim, and to do the Kirkus review questions on the audio book of BURY YOUR DEAD. Kirkus (a prestiguous US literary magazine gave the book a starred review and has declared the audio book an october hot read - thanks to Ralph Cosham who does the narration - brilliantly). Then went out - only to return to hear I'd missed the phone call for the interview for Le Voix de l'est - newspaper. I thought the interview was for 4pm. Seems it was for 2pm. I know where I made my mistake. the difference between 4pm and 1400 hrs. They said quatorze heures and I heard quatre heures. The French here use the 24 hour clock - the English use the am/pm clock. Either way, I was wrong. So I called her up and fortunately, no harm done. Thank's to Michael's son, Victor, who just spent almost a week with us, we are now starting the day with fruit smoothies. Vic showed us how, and we now do bananas, blueberries, strawberries and soy milk. Fabulous. Michael got up at 5am a few mornings ago (0500hrs) to look at Mars. Apparently it will not be this bright again for 5,000 years - so seemed worth the effort. But he had a difficult decision...wake me up, or let me sleep. He knows me. He let me sleep. Especailly since I was in the final throes of finishing the fourth draft and he knows how precious sleep is for that (and for peace in our home). But last night he came in about 10 pm with the binoculars and said, 'I'd like to invite you to Mars' - so off we went to the upper balcony, and there was Mars - brilliant in the night sky. Stunning day! And wonderful news. I finally finished the fourth draft. Thought for sure this would be the book that kills me. Not because there's anything wrong with the book - I hope! But because of all the other things in my life. Have pledge to say 'no thank you' to everything next summer. And just have two quiet months, Michael and me alone in Sutton. It's gotten to the point where days when all I have to do is write feel like vacation. Like today. Had 20 pages to complete and took me all day. Sometimes the fine-tuning is like that. I can stare at a sentence for half an hour wondering why it just isn't right. And then taking it out changes everything around it and so that needs fixing - and made better. There's just a whole lot of very, very delicate work. But also took a day away from it last week. Michael and I went with our friend Susan to Shelburne, Vermont. Stayed Thursday night at the Shelburne Inn - which is on a spit of land jutting into Lake Champlain. Fabulous home build by one of the Vanderbilt daughters. Huge - but apparently considered something of a shack compared to the homes of other robber barons that were built on long island etc. They were considered quite strange to come to Vermont. But the home has been preserved - furniture saved - and so staying there is like getting into the time machine and stepping out a glorious Vanderbilt in the late 1800's. Except - there's running water and electricity. But - no air conditioning or heating. So the Inn is closed from Oct. to May. It's in a 400 acre farm - that produces cheese and meat and vegetables. And that was why we were there...to take part in a Vermont Farm Fresh dinner thursday night. To say it was magical would be to sell it short. We arrived at about ten to six for the six o'clock dinner. Parked the car outside the huge barn, expecting to be show to tables inside. But instead, we were shown up a path through a field, and up a hill. To a plateau. There, long tables had been set with white linens, silverware, glasses. flowers. A beehive oven was making bread. A bar had been set up and young men and women in livery were serving. We chose a table at random, got a drink, and then it was time to eat. Course after fresh course. Salads, casseroles, free range beef wrapped in cabbage, all different ways to do summer and winter squash. And two young women who'd grown the vegetables and harvested them, were there, talking about it. And from the field, as the sun set, we looked out across the farm, to the Green Mountains in the distance. Candles were lit. Dessert came. Tiny cupcakes made of fruits and beets, with whipped icing. And then we followed the lamps back down the path, to our cars. Knowing we hadn't had just a meal - but a memory. Next morning we got up, wandered the grounds of the Inn - had a magnificent breakfast. Sat in adirondack chairs by the lake. Then drove home. Amazed, yet again, at our good fortune and dumb luck, to live here. I haven't blogged, as you might have noticed, for a few days. Life too hectic - have been focussing on getting the edit done. Some more smoothing still before I'll print it out - but it's all there. Just a small thought here - a clarification there. Had a lovely, big article in La Presse yesterday on the French version of Still Life, called En plein coeur. And nice mention in Le Devoir as well. Have an interview tomorrow afternoon with the newspaper La Voix de L'est, and a TV interview, taping at Hovey Manor (more suffering, I'm afraid) - with Radio Canada Television - on Tuesday. Then off to Toronto for an event at the Canadian national Exhibition on Thursday night with Linwood Barclay. He's terrific - wonderful writer and lovely person. Then home Friday. Doug and the kids are coming for the long Labour Day weekend. Oh, and I still need to write the Sept Newsletter. Yikes. Gotta run. Hope you've been well. Speak soon! Thank you for all your supportive comments - limping toward 'the end'...hoping to finish this fourth draft by Sunday. Then will write the September newsletter on Monday. But I must tell you about the launch of En plein coeur...well, not really a launch since it doesn't actually come out until Sept 2nd. but this was an intimate lunch for the books editor at La Presse, and a book reviewer at Voir. Simone, the publicist was there, as were Louise Loiselle, the publisher at Flammarion Quebec, and Michael Saint-Germain - the translator. The good news is that the editor at La Presse really liked the book! The other woman hadn't had the chance to read it all, but was enthusiastic. Can't tell you what a relief that was. And the food was spectacular. Restaurant called Le Local. Highly recommended - though very hard to find. It's on rue William in Montreal. Susan and I had once again practiced, and realized I'd said, at one point, that I had very big vacuums. What I'd meant to say was I have large aspirations. Aspirations. Aspirateurs. French - a language of nuance. Tried not to repeat that over lunch. We chatted away in both French and english, often switiching in mid-sentence. Some days my french is good, many days it's very bad. But not as bad as my Italian. I remember when Michael and I arrived at the airport in Venice several years ago, while he organized the luggage I went in search of the vaporetto (sp?) - the water taxi's - that would take us to our hotel on the Grand Canal. I found the desk, went over to them, opened my mouth, and only then did I realize I don't speak Italian. you'd think, maybe, I'd have known that a little earlier - but it actually came as a surprise. I also remember doing an interview on CBC Radio - live on air - one of my first. I was asking one of the Vietnamese boat people - back in the early 80's - about his experiences. 'Tell me what it was like leaving your home?' I asked. 'What was the journey like?' I asked, slowly, clearly. Loudly. I was faced with a choice. either come up with a series of questions whose answer was '87' (What comes after 86? ), or saying 'Thank you, and goodbye.' I said goodbye. I've often wondered if that man realized he didn't speak English. And why he'd ever agree to do an interivew in a language he obviously did not speak. Now, as I face a raft of interviews in French, I'm beginning to understand how this sort of thing happens. Wishful thinking and the inestimable power of delusion. After the lunch Michael and I jumped in the car and headed to Granby to see jacques and Louise. We wanted to be careful not to exhaust Jacques, but we ended up staying an hour and a half. And he and Louise continue to amaze us. He's no longer eating or drinking. slivers of ice is all he can manage. It is in other hands than ours, or his. Louise continues to be gracious and open. But it's exhausting. Then home about 7pm...took peanut butter sandwiches up to bed. Asleep by 8:30. The thrilling life of a writer!! Spending today in sweats in front of the fireplace, editing...juggling scenes...writing a few new ones...as I read the hardcopy manuscript I realized I needed to switch the location of a scene and add a character - which of course reverberates through the rest of the scenes. So that takes time. Hope to get to page 180 today. 200 tomorrow - heading off at noon to drive to Shelburne Farms Inn, south of Burlington, Vermont. Susan, Michael and I are taking part in the framers dinner tomorrow night. They're holding it in the barn onsite. Then we're all staying the night at the Inn, and going to the Ansel Adams exhibit at the Shelburne Museum on Friday. Home early afternoon. Really looking forward to that! A late summer treat. Speak soon - and hope all your vacuums are met. Sitting by the pool with Michael and Victor - they're swimming and I'm...not. I just came out from sitting in front of the fireplace. It seems the guys and I are living in different seasons. They're still in summer and I've slipped in to autumn. I'm even in sweats. Still, it's lovely sitting out here. Haven't blogged for a few days...hectic. Saturday was very busy...drove out, met Susan for breakfast, then drove to Knowlton for the SPCA day. I had two dogs - Daisy and Enya. Daisy is the dog on the left and Enya's on the right. both older, both up for fostering rather than adoption...which basically meant instead of the 280 dollar adoption fee they'd be free, since the spca just wants them to find a nice home to end their lives. I was thrilled when our friend Hope adopted Daisy! But sadly Enya didn't find a home. In fact, not many did. Last year the spca brought 22 dogs and adopted 17. This year they brought 25 and only found homes for 3. It was a little rainy, so that probably stopped people from coming out. I have to say, I almost decided to foster Enya, but considering our schedule I realized we'd be away off and on for a while and it wouldn't be fair on her, or Pat and Tony. Or Trudy. Both dogs would need more stability. But it breaks the heart to see all the dogs getting back on the truck. Happily they have a great home at the spca Monteregie in the country. then off to visit friends - and after that Michael, Victor and I went to the cottage for a late dinner with susan and her friend Liz. Excellent bbq - and lemon posset. yum yum. sunday was supposed to be just writing but ended up being a whole lot of other stuff too...getting quite stressed. I was saying to my brother Doug that I'm now like a miser, but instead of counting money I pour over my agenda, looking for free days, half days, days when I can just edit. And, God willing, maybe a few days between the fourth draft and the beginning of the tour. Today loads of visitors - but good stuff. Editing. Influx, infestation almost, of mice. poor things. Furnace cleaner came. Editing. Pat and tony dropped by to show us their terrific new truck. Editing. Susan and Liz coming in about an hour for dinner. bbq. easy. Still have five more pages to edit before then. off to montreal tomorrow for press launch of En plein coeur - at a great restaurant in Old Montreal. Then some interviews, in French - then home, via Granby to visit Jacques and Louise in hospital. Hoping to get more editing done Wednesday. I sometimes feel quite stressed....and have to take a step back and realize even if this book isn't finished, it's not the end of the world. the end of the world looks quite different than an unfinished manuscript, and sitting by the pool. Be well - will blog again when I get the chance...but I do think of you through the day. Please keep speading the word about Bury Your Dead. I'd LOVE for this book to do well! thank you. Lovely day - set alarm for 6:30 - made cafe au lait - and sat down to edit...got to page 70 of draft 4. Surprised how much I'm liking this book - and this part of the process. Also surprised how many small, but now apparently important, changes I'm making. Not to whodunit - but more fleshing out the themes and intertwining them. Love this stage, as long as the rest of the story and the characters are strong. Worked until noon - then called Susan for a French refresher. Then got dressed...was going to wear a white skirt and blue blouse - but then realized this was going to be taped and played in late september...best not to look too summery. So I scoured the clothes I had in Montreal and found a tweed blazer, and quite nice scarf, a top and some appropriate jewelry. So that worked out. Then left...decided to give it an hour to walk across the city. Lovely day, and walking clears the head...I can think, or not. Practice my French. So I mumbled my way across this fine city. But needed to cab the final few blocks since it was a little further than I thought. And while the tweed was good for a while, with vigorous walking it did get a little hot. Thought it would be a shame to have 'perfected' my French only to be all red and sweaty in the interview. Arrived in good time - was shown through these labyrinthine passages at TVA until we finally arrived at the studio. The make-up woman was lovely. English. Though we had strick instructions to practice French, as soon as the door closed we yakked away in English. Though it would have hardly been the first time I'd have carried on a conversation in French with someone only to realize at the end that they were English too. then it was time for the interview. These people at Le Livres Show are wonderful. Having been a host on CBC Radio for many years I can spot people who are pros - and who genuinely care...and those who are neither. Marie-Josee, and Josee the host were very comforting - really worked to make me, and the other guest Anne, at ease. And it did go well!! Of course, they didn't ask any of the questions Susan and I prepared...but all that practice helped a lot. I'm always afraid I look like a moron...but we'll see. Lots of people will see! It will be played quite a few times in September, and I'll put a link up when I can. Thank you for all your moral support. Getting up at 6 tomorrow...heading to Sutton - breakfast with Susan in Sutton then doing the farmers market - then off to Knowlton for the SPCA day. Spending Sunday and Monday writing...ahhh. Can hardly wait. Two days to do nothing other than write. heaven. Lovely easy drive in to Montreal. Spent the day editing - fourth draft. Got to page 37 - quit about 5:30. Too tired really to enjoy it and have any judgment left. Had the most wonderful dinner at the cottage with Susan last night. Chicken and pork on the barbeque (just corrected a typo where I initially wrote children and pork on the bbq - oh oh). And two fabulous salads, one with watermelon, parsley, spanish onions, olives, feta cheese. Unbelievably good. the other was a yummy quinoa and cranberry salad. In this latest book, set in June, I have Gamache eating a quinoa and mango salad. Seemed like a good combo. Must use the watermelon one too. Lovely fresh fruit salad for dessert. have the French TV interview tomorrow. Susan was wonderful, helping me practice. Wonderful to have a quiet day here, to just concentrate on writing. Am really loving this book...at the smoothing out stage now. Love this stage. less terrifying. While we were away a few scenes and adjustments occurred to me, so the manuscript is littered with notes. Tomorrow will write in the morning, try to get my hair done around noon, get to the TV studio for make-up at 2pm. I always feel like a cartoon character in TV make-up. Will probably sound like one too. Wilma Flintstone - or, in French - Wilma Pierrefou. Susan told us the Champlain bridge will be down from 3 lanes going south out of the city, to one lane this weekend. Construction! Have to decide whether to drive out in rush hour after the interview or stay over anyway and get up early Saturday and risk hitting terrible traffic over the bridge. I go back and forth on the decision. 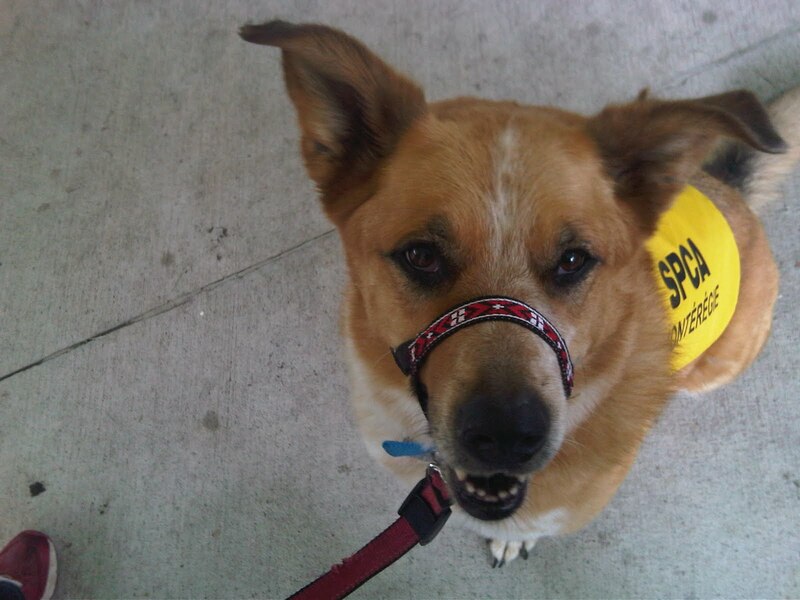 Need to be in Knowlton for the SPCA adoption day by 11 am. Still, I'm leaning toward staying over...but will see. Michael stayed in the country...his son Vic is coming for a week or so, so this gives them a few days on their own. Always nice. Hope you're enjoying your week. Will let you know how the interview goes...light a candle! Not sure what to wear today...started in sweats, moved to flannel, then to half and half. Woe is me. Read out on the screen porch, sipping cafe au lait and eating fresh peaches. More woe. Plodded around the pond with Trudy, where we looked for geese and bass, but found mosquitoes and poop instead - so all was not wasted. tons of emails, of course. The fall tour is taking shape. looks like I'm leaving here Sept 20th and returning sometime in late November. All over Canada, the US and off to Britain. then over Canada and US again. So I really need to finish this manuscript before I leave in Sept. But am taking Saturday off from the manuscript to volunteer at the SPCA adoption day in Knowlton. It's for the dogs at the SPCA Monteregie, the local no-kill shelter. I'll be one of the 20 dog-walkers. From 11am to 3pm. the hope, obviously, is to find homes for some of these dogs. 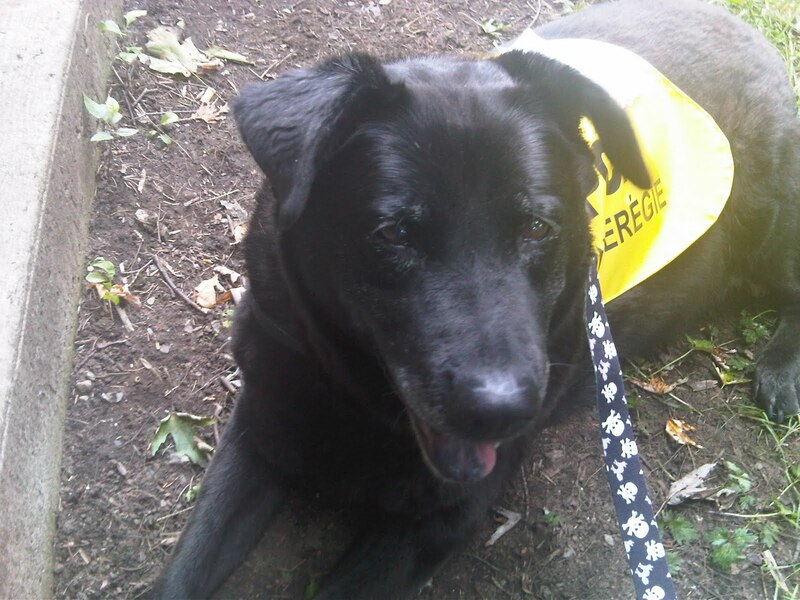 We're sort of thinking of finding a brother or sister for Trudy...an older dog, perhaps. It's hard because we have such a great relationship with Trudy - it's very different having just one dog...we really focus on her and have a quite special relationship. But we also know that Trudy's a very social dog, who loves other animals. so we think while she's happy, she might be happier with a sibling. But it would have to be a very special dog. We'll know her/him when we see her/him. I think I'm a little more enthusiastic about another dog than Michael is. He loves just having Trudy. So we're in no rush. Have to wear Michael down. That can take a while. Off tomorrow morning for breakfast in Cowansville then visiting Jacques and Louise about 9am. Then home to work, then off to dinner with susan at the guest cottage. had great fun with susan yesterday. She came for a swim, then relaxed dinner of barbequed corn on the cob and burgers...Susan (who's a great cook) showed us how to do Mexican corn....barbeque it, slather with butter, then sprinkle cheese like parmesan, and cayenne pepper...and finally squirt lime on it. Susan also made this wonderful lemon custard sort of dessert, with raspberries and peaches and whipped cream. Oh, oh - now I'm hungry again. Wow, were we pooped! Sort of giddy. The flight was perfect...and not really all that long from Vancouver to Montreal. We were lucky the festival paid for the upgrade to - not business class - but the next best thing...the emergency exit seats. Air Canada, like many carriers, is now charging for the extra legroom seats...which is fine with me. Means we're guaranteed to get them, if we book early enough. but air Canada is so cheap I suspect if anything happened to the plane they'd charge people to use the emergency exit. Michael slept a bit but I just relaxed, listened to music, read, watched old episodes of some forgettable sitcom. - I've forgotten which one. And just had a nice flight. Got in, got the bags, grabbed a cab...that for me is one of the ahhhh moments in travel...sitting back in the taxi on the way home. No more worries, no wondering if this will go OK, or that will happen. What a waste of time worry is, and I'm sure getting better - but it still feels amazing to lean back in the taxi and look out the window. Phew. I loaded the car while Michael went to the apartment and picked up whatever we'd left (mostly recycling) - then we whizzed down to the Granby Hospital - and there was Jacques, sitting up in bed eating cucumber fresh from their garden! For a man we never thought we'd see again he was looking very much alive. And laughing, and the look on his face as he ate the thin slice of cucumber. Better than a lottery win, better than 600 threat count sheets, better than any upgrade or luxury suite. We tried not to stay too long and tire him out, but it's hard because we love his company, and he's very gracious. We went with Louise to the family lounge and had a wonderful talk. She told me in the evenings, in their quiet time, she reads The Brutal Telling to him until he's too tired, and he falls asleep. I can't tell you what that means to me, and does to me, to hear that. Better than any upgrade, or luxury suite, or 600 threat count sheets. But perhaps not quite as splendid as a single slice of cucumber. Susan's arriving in an hour or so to stay at the cottage. The young couple who are there will leave in a couple of hours. She's Kelley - the daughter of our friend Wilder, and her husband is Brent. They have a 2 year old daughter, Freya. Brent is a doctor and has been deployed to Afghanistan. He's been there 6 months. This is his leave, so we gave them the cottage so that the family could be alone. Their thin slice of cucumber. But we did drop by briefly yesterday afternoon to say hi. We'd never met Brent. They're very brave. As are thousands and thousands of families - as you know. We had a nap, then had dinner, and went to bed again. Fell asleep knowing how lucky we are - deep dreams of peace. Very hot, by Vancouver standards. Gorgeous day. Woke up to very loud sounds coming from outside our window. Since there's not much there except water we were a little baffled until we noticed...fins! A dorsal fin...two, three...and arched backs. A pod of dolphins was playing right outside our window! We didn't realize it at the time, but learned later that this is an extremely rare sighting. It was just after 6am. We threw on some clothes and ran out onto the balcony...by then they'd moved on, but not too far. Though too far for a photo - sadly. But we were astonished, and thrilled and amazed. We went for a walk, then, along the shore, and spoke to the people there - including two people sitting on their verandah's, and both had seen the dolphins too. And told us they'd never seen them there before. And were enraptured too. There's also a grey whale out there, but we didn't see it. Lonnie and Susan picked us up at 8:30 - we'd packed and checked out - and drove us to the literary festival grounds. We went up to the building...now I have to say, I was a little worried that at 9am on Saturday there'd be four of us there....and 400 empty seats. So I was relieved when there was already a line-up. And by the time Lonnie introduced me the place was packed. Lonnie was hilarious - telling everyone how our reaction to everything we saw was, "oh wow' or 'oh my God'. Not particularly creative or descriptive. He had them howling with laughter! And it was quite true. Even coming back on the ferry tonight Michael and I kept repeating, Oh Wow...Oh my god, look at that. The event went very well - always a relief...and great questions from the audience. Lots of books to sign - which is also a relief. Then Michael and I had a coffee with Lawrence Hill and his wife Miranda. Such incredibly kind people. So supportive of other writers. Warm and funny and generous. Then Pat picked us up to take us to a gathering of three book clubs, who'd invited us to this wonderful pot luck lunch down the coast. Such nice people - fascinating to listen to their lives and experiences. And it was sure a treat to have a healthy, home-made meal. Then back to the festival...chatted with a few people - then changed into travel chothes, and Lonnie and Susan took us to the ferry. An airport limo met us at the other side, and now we're at the airport...at the gate...with three hours until the flight! Long day. We arrive about 7am (or might be 8) in Montreal. Will grab a cab to the apartment, pack our stuff, hop in the car and get to the Granby hospital to see Jacques and Louise. How wonderful that will be! And then, home to Sutton. Long day. But a good day. I'm thinking we might call Pat and ask if she can pick up some groceries for us - milk and fruit...just something for breakfast Monday. I think we'll be way too tired to do shopping. Looking forward to our own beds. But, as you've probably gathered, the Sunshine Coast Festival of the Written Arts is one spectacular literary festival. I think it's the best we've ever been at. To get more than 400 people at each event, at give each author a full hour to talk, read, take questions...it's bliss. I'll blog again Monday. Our friend Susan's arriving Monday for a couple of weeks stay in the cottage...coming for dinner Monday night. I hope she doesn't mind milk and fruit. And a photo of a pie for dessert. Gorgeous day!!! Yesterday was hectic and tiring, but let me tell you a little about it. Started with our last breakfast at the fabulous A Place by the Sea. 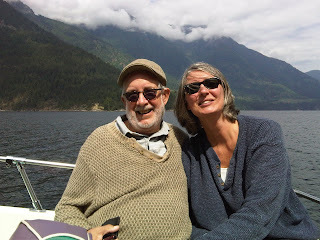 then frenzied packing - and Nancy came and got us for the cruise - which was captained by her husband Shay (pronounced Shy). He was wonderful...very funny, passionate, knowledgable, and we had great confidence in him. He's from Israel - was 6 years in the army - now has 2 grown sons and wanted to get them out before they had to serve. He speaks his mind and has a wonderful sense of humour. He's alos a real estate agent. 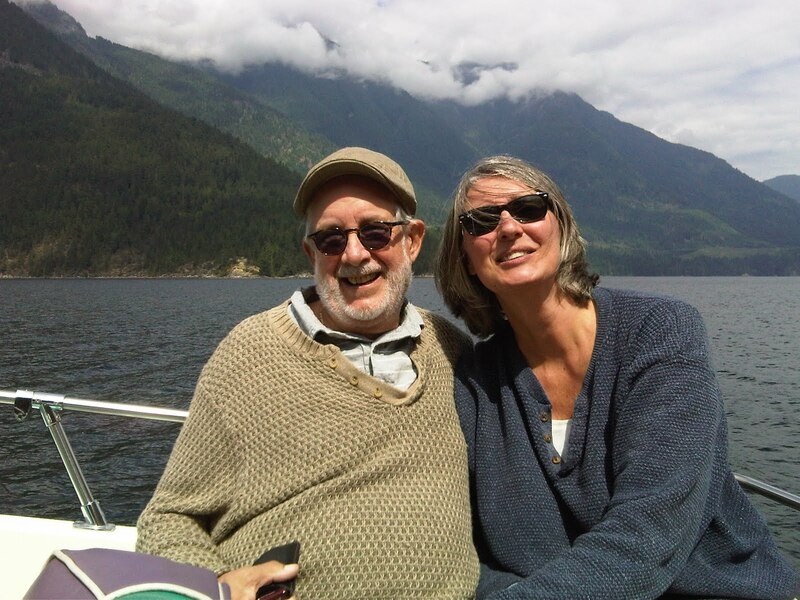 I think HGTV should send a crew and build a show around Shay and Nancy - their luxury B and B on a rugged coast of BC, their cruises, and his real estate escapades. I'd watch. We went down the bay and up Salmon Arm and it was exquisite, as you can see by the wind-blown photo. It really is a blessing I have no sense of personal aesthetics. Good hair, bad hair, flat hair, facial hair, no hair - I don't care. Talk about rugged...fortests right to the shore. And every now and then an isolated cabin. And, like the hermit's cabin in The Brutal Telling - a big part of me yearned to ask Shay to drop us off and we'll just live there. Quietly. Peacefully. I suspect Michael would have something to say about that! And I suspect that while I dream of such a thing, the reality might be quite different. But for a week? Ahhh. As you might be able to see, too, I didn't put a hat on fast enough, nor did I think to do the sunscreen....so now I'm beet red - an unbecoming blush. I arrived back at the dock with hair both flattened and standing up in areas, and a face as red as a glorious sunset. And a smile to shame the Buddha. Both Michael and I had just the best time. Nancy had made this wonderful, endless, lunch which we ate on the upper deck. Smoke salmon spread, cheese, vegetables, an assortment of gourmet crackers, deviled eggs (which I adore) - then smoked salmon sandwiches, with mango of all things...an inspired combination - and a gorgeous plate of fresh fruit - cherries, strawberries, peaches, oranges. Yum. Honestly - what an astonishing life. Because of you. Yes, I mean you. Because you're supporting the books. It's only because of that that we're invited to wonderful festivals in divine places, Like the Sunshine Coast of British Columbia. Nancy drove us to the Driftwood - and the good luck continued! Our room is actually very nice...newly renovated, clean, and right on the ocean...we went to sleep with the sound of the waves on the shore 20 feet away. So, I owe the driftwood an apology for my last past. This isn't a dump. And besides, the staff here is wonderful - very friendly despite it being fully booked and very active. Had the cocktail last night - the terriific Lonnie and Susan picked us up for that, and Susan brought some homemade banana bread - which didn't last long, I'll tell you!!! Then, I'm embarrassed to admit, Michael and I were just too tired to do Lawrence Hill last night - so we came home, crawled into bed with a diet coke and some peanuts - and read. Lights out by 10pm. Breakfast and a walk along the shore this morning...the top photo was taken then by a very nice passerby. Then off to the festival. We are really having just the best time here. We arrived to hear Adam Schroeder read from several of his works. he was brilliant! Even sang a song. Loved it. Then met Gwen Southin and her husband Vic for lunch - did a sound check, then it was our turn. Or really, her turn. I was just asking the questions. Now, in my experience of quite a few literary festivals, the Sunshine Coast Festival of the Written Arts is unique in several ways. It has only one author 'performing' at a time. Often festivals have what they call 'streams' and there are two or three of them, so you need to choose and it can be frustrating when you have competing desires. Here there is only on stream. And the venue is magnificent. Made of wood, with great tree trunks holding it up, built in the forest with two sides open. It holds 450 people, and is always full. As a writer, when you do an event you often consider yourself luck if 100 people show. Often it's empty!!! But the idea that 450 people will be there is amazing. And perhaps just a little frightening. But everyone is just so friendly. Gwen is 83. She has 4 books out, beginning with Dead in a Family Way, published when she was 73. And the latest, Dead as a Last Resort just out. 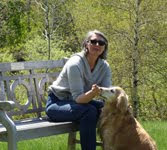 She's also the co-author of the Great Canadian Literary Cookbook....and a co-founder of this festival 27 years ago. Like the other women who founded it, she spent most of the first years in the kitchen! And described sweeping up long after everyone else had gone home. It was such a privilege to be asked to interview her on stage this afternoon - and to look out and see 450 beaming faces - people there to celebrate what this woman had achieved....creating the festival, and then going on to be one of the featured authors! Deeply moving. Then, as though that wasn't enough, at the end of the event, Jane Davidson, the fabulous director of the festival, came on stage with a glorious bouquet of flowers....from Gwen's husband of 65 years, Vic. Well, we were all in tears. As she said, no one achieves what she has without a husband who is a true partner. There's a photo at the top of Gwen and me at the cocktail last night. She's standing straight, and I'm bending down...doing our imitation of a totem pole! How lucky, lucky, lucky I am. Doing my event at 9am tomorrow - then a local book club has generously offered to host a pot luck for Michael and me, then Lonnie and Susan will pick us up and take us to the ferry. 45 minutes boat ride back to Vancouver...then airport limo to the airport and the red-eye home. Hurrying home to see Jacques and Louise!!! Speak to you tomorrow, perhaps...not actually sure when I'll get a chance...but will try. Clearing up and getting warmer. Great sleep last night after the barbeque. As it turned out, in the past they've had a salmon BBQ but have now decided the logistics are just too great - so it was terrific burgers, and salads and fruit, and cake. Lonnie and Susan - our guardians - came and picked us up, looked after us, and dropped us off. Funny how close you get to people who had been perfect strangers, when thrust together in an event. A shared, unusual, experience. Like a life boat, or fox hole. or literary festival. There're no atheists at lit fests. Actually, I imagine there're quite a few. Had a lovely day today spent mostly reading. Oh, about the shouting kids from yesterday afternoon...I spent this morning waiting for them to wake up and shatter the peace. But it didn't come and didn't come. Then when Nancy served our scrumptious breakfast of a sort of bread pudding with cinnamon apples - but first a warm orange and cranberry homemade scone and fresh fruit salad - I asked about the kids. Seems they weren't checking in, but belonged to a couple coming next week...and leaving the kids at home. This is a kids-free Bed and Breakfast. Phew. I honestly don't mind children...but when I've been longing for peace and quiet, and in this tranquil setting, it just would have been a disappointment to have had someone else's children shrieking around. Tomorrow's a big day...a six hour private cruise on the b and b's yacht, around the coast, including stopping at a beach accessible only by small boat, and a swim, lunch in the cove, then more yachting. And more suffering! 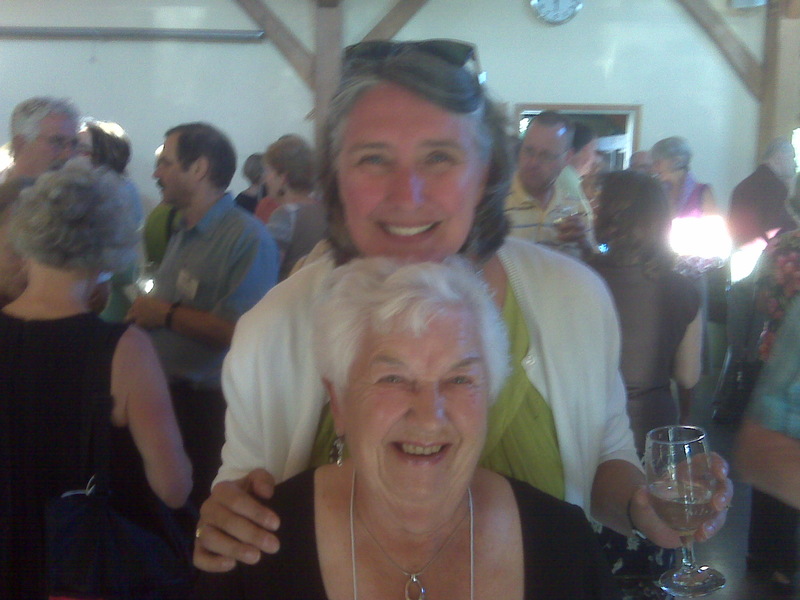 So - check out of here, and move to the Literary Festival official hotel - the Driftwood Inn, in downtown Sechelt. has the advantage of being walking distance to the fest - which offically beings tomrrow night with a cocktail, followed by Lawrence Hill's event - but the Driftwood hotel, by all accounts, has one major disadvantage. So we're lapping up as much luxury as we can get, until we move. Hope you're enjoying the trip so far! We're having a blast. As you can see, the sun has come out. This was my office this morning. 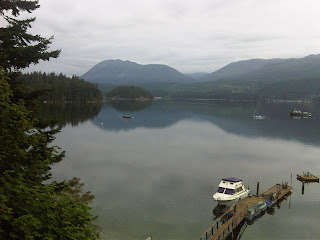 Michael and I sat on the dock of our Bed and Breakfast here in Sechelt, sipping coffee and each reading our manuscripts. And glancing out at this view. A heron came and sat on the swimming dock beside us. Had a short nap this afternoon. Read 50 pages of the third draft. Reads well, so far. Making lots of notes, but nothing major. So far no structural or profound changes. Thank God. Had a lovely 2 hour massage yesterday. It was delayed by about half an hour because the masseuse lives on an island and she had to wait for high tide to get out. Imagine setting your watch by the tides? How wonderful is that? As I write a float plane is taking off and banking around the island you see in the photo. Lonnie and Susan are picking us up and taking us to the salmon barbeque tonight. So kind to include us. It's meant as a celebration and thank you for all the volunteers at the Sunshine Coast Festival of the Written Arts, which doesn't really start until the cocktail Thursday evening. We have an empty day tomorrow, thank heaven. Nothing but more sitting on the dock, more reading. Heaven. Michael spoke to Jacques today, as he does every day. Briefly now. Jacques' strength is going rapidly. Louise sent me an email last night, and we write back and forth. She says she sometimes feels her heart could just explode it's so full of sadness. We wish we were there. But the fact is, the time is short, and it's for Louise and Jacques. And if we can't be there, we're so glad to be here. Looking out on this extraordinary scene of peace. We're in British Columbia, in Sechelt, on the Sunshine Coast. This picture was taken this morning - when the rain was just about to begin. They get a lot of rain in Vancouver, but not much here...the name is meant to be description, apparently, not ironic! It was sunny and hot all july. Too sunny and hot. Forest fires broke out. In fact, when we arrived in Vancouver yesterday Lonnie and Susan (the amazing Sunshine Coast Lit Fest volunteers who met the plane) pointed out the what we thought was mist was in fact smoke from the fires. They've had rain the last couple of days, so that's a blessing. But after this morning's rain it has cleared and now it's a lovely day. We're sitting on the verandah looking out over the sound. The small boats, the warf, the island where the float planes circle after take off and before landing. It really is magical. Our B and B is called A Place by the Sea. We're staying in the Sea Breeze Suite. Two hour massage this afternoon. Then dinner in front of the fire place, relaxing and reading. We were going to go on a six hour private cruise of the coastline but the weather's looking a bit dodgy so we've delayed until Thursday. Tomorrow and Wednesday just quiet days. I'll read my manuscript. Michael will sketch, and read his book. While we look over the sea, at the cranes, and sea gulls and huge numbers of eagles. So different from home. Had a terrific flight from Toronto. About 5 hours, very easy. The lovely festival people plumped for the upgraded seats at the emergency exits so we had scads of space. One of the flight attendants sat beside us during take off and we got to chatting. Her name's Mimi. Young - works the long hauls, married to a pilot, two small children, and she's writing the music and lyrics for her first album - to be recorded in October!! We felt like slugs. But what a lovely young woman. And, her mother-in-law has written her first book and gotten it published! Her name is Carolyn Muir Helfenstein and the book is called 'Why Not? A memoir In Black and White'. It sounds terrific. I plan to ask Danny and Lucy, at Brome Lake Books to order it for us. Tomorrow the only thing on our agenda is a salmon barbeque for the volunteers at the Sunshine Coast Festival of the Written Arts. 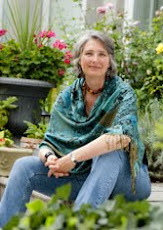 The organizor of the fest - Jane Davidson - has kindly invited us. We're so looking forward to it. I'll tell you, when I was writing Still Life all alone it never occurred to me Gamache, Clara et al would take us around the world, including a salmon barbeque on the edge of British Columbia. How lucky are we? Speak to you tomorrow! And if you ever plan to come to BC you must consider the Sunshine Coast - and stay at A Place by the Sea. If an exhale had walls and view, this would be it. Had a fabulous time at Stratford. A little nerve-wracking before - but often is. Nerves. Wracking. The theatre was sold out - which always feels great. it was decided I'd go first - and Giles Blunt would go second. I'm happy with that - get it out of the way, then I can just sit and enjoy. I relaxed about halfway through the first reading. Basically, Giles and I were each given 20 minutes to read - then there' be 20 minutes for questions from the audience. And then a signing. I decided to do a theme - of setting. The fact I deliberately chose to set my books in Canada, and mostly in Quebec. And that I wanted a very keen sense of place, so there could be no doubt. I chose three short readings. The very beginning of STILL LIFE, Gamache's arrival on the Queen Charlotte Islands from THE BRUTAL TELLING and finally a reading from BURY YOUR DEAD, describing the bitter cold, and standing in front of the Chateau Frontenac, with the massive statue of Champlain surveying old Quebec City. Giles was wonderful, as always, and the audience very receptive and relaxed. Good questions too. And then the signing, and getting to meet a lot of strangers, but - what joy - getting to meet a few of you. How terrific that was! I know many of you drove a long way to be there, and I'm very, very grateful for your effort! It was a joy to shake your hand, give and receive a hug. Then Michael, his cousin Marjorie and his sons Vic and Mike and I all went out to the Belfry Restaurant in Stratford for lunch. It's in an old church - marvelous. Had the best dessert ever...Ontario Cherry Soup. Yum. 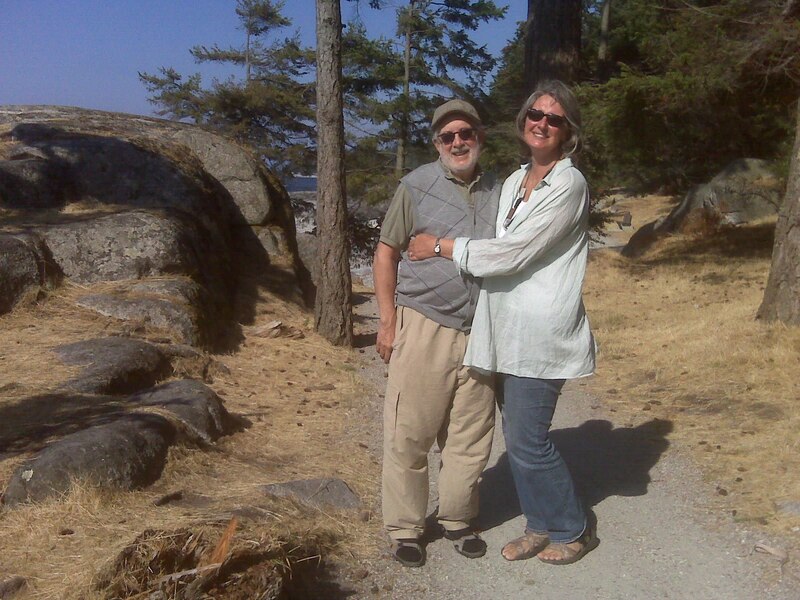 And now, next morning, Michael and I are at the Toronto airport, ready to head to Vancouver, where Lonnie and Susan, volunteers at the Sunshine Coast literary festival, will pick us up, drive us to the ferry and take us across to the coast. And drive us to our B and B in Sechelt. A long day - but it would have been far longer without Lonnie and Susan! We're taking them out for dinner as a small 'thank you'. So looking forward to seeing this part of the country. If any of you saw the old Canadian TV series, The Beachcombers, it was filmed on the Sunshine Coast. Stunning - gorgeous coast and mountains. Mostly I'm looking forward to relaxing, walking, enjoying the sea air, and finishing Michael's brilliant manuscript. Might actually finish on the plane. 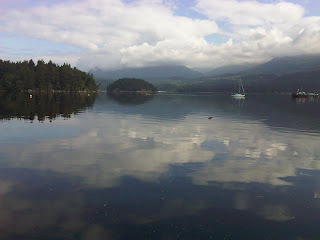 Will try to blog from there...be well - and hope you enjoy your visit to British Columbia's Sunshine Coast! Exciting day! It started with the most wonderful breakfast with our friend Myrna. A large black woman who is a psychologist in Montreal. Sound familiar? her last name is Lashly. Not Landers. So you can see she absolutely did not inspire me to create the large black woman named Myrna who lives in Three Pines! OK. I lied. She did. We adore Myrna, and when it came time to create the Three Pines characters I chose Myrna first, because I love her company. But we'd moved to the country and had lost track of her a few years earlier, though when the book first came out I told her about the character and (fortunately!!) she was delighted - and saw it for what it is, a celebration of our friendship. Still, it was very generous of her. But then I finally wrote her again yesterday, and we emailed back and forth and then decided we needed to have breakfast together. Michael actually knew Myrna before I did - and they adore each other. We've missed Myrna in our lives. And as soon as we saw her again our hearts just filled. We met at 9am and were still yakking away at 11:30, when Michael and I had to scoot across town to meet my French publisher for lunch. So we said bye to Myrna - but I know now we won't drift apart again. I'm not sure I knew how much I missed her until she was again in my arms...and I saw Michael and Myrna holding each other tight. What a blessing. then off we rushed, up to Outremont, and lunch at Milos, a magnificent Greek restaurant on Park Ave in Montreal. Renown for its fish. We met Louise Loiselle there to celebrate that copies of STILL LIFE in French had arrived. As we made it to the table Louise was already there, and sitting on the white linen table cloth was the book. I was actually trembling as I held it. It is beautiful. And deeply meaningful - that the book can now (or as of Sept 2nd) be read by my friends and neighbours. By the majority of people in the place I choose to live. In the language most of my characters speak in. The book is called: En plein coeur. and such fun, to celebrate with this wonderful publisher in one of the finest restaurants in Canada. With Michael. And the book. And the memory of Myrna fresh. Quiet day in Montreal, spent reading Michael's manuscript - The Halo Effect - on the balcony. Eating ripe mango. What a fabulous book Michael's written, about screening for childhood cancer and the race to cure neuroblastoma. And how what they learned affects us all, whether it's screening for breast cancer, or prostate, or any kind. He manages to take us into the labs, the bedside, the minds of the doctors and researchers, and the hearts of the patients and parents. It's deeply powerful. With this very intricate structure that appears so natural and normal but in in fact very complex. Fantastic and very exciting. Am halfway through and had to stop to catch my breath. Water turned off at the apartment for two hours this morning, so we headed out for breakfast, taking each other's manuscripts with us. After breakfast we ordered coffees and just read for two hours. And used their bathroom! At noon we returned home, to running water, fresh mangos and a lovely hour or so out on the balcony. Michael finished reading the book I'm currently writing. Says he loves it...with a few notes on clarifications. So I'm thrilled! I'll read it myself when we head out to BC on the weekend. Michael spoke to Jacques this morning, had a fun chat. Will keep you informed. Thank you for all your support! We spent the morning with Jacques and Louise at the Granby Hospital. Funny, but as soon as we walked through the door into the Palliative Care wing we could feel a peace. Not necessarily a personal peace, but it felt like a sigh. The colours were warm and muted, there was no rush, no bright lights and hubbub. Just calm. We found Jacques' room. He was asleep. Louise had been there earlier and had gone home for a few minutes. It was just past 9am. Jacques woke up, we sat down, and except for a few trips down to the nearby 'living room' for quiet talks with Louise, we were with Jacques for three hours. We'd fully expected he'd only be able to stand us for 20 minutes. Indeed, he made it clear he'd tell us when he was getting too tired. We were beyond thrilled when the visit just went on - like a really fine dinner party no one wants to end. Oddly, when Louise (his partner) Michael and I left so he could be bathed - we nipped down to the cafeteria - the priest arrived. And gave Jacques the last rites. When we returned Jacques told us about it. And told the priest that he was born, he was about to die, and he was a peace with that and everything that happened between. But the details were none of the priests business. Apparently the priest laughed and agreed. And said as long as Jacques was at peace, so was he. But I must say, it gave us all a bit of a turn to hear he'd been given the last rites. Louise and I left the guys alone, and went to the lounge to talk. She's amazing...trying to help Jacques do what he needs to do, and not bring her own fears into it. Time for that later, she said. And this is where One Day at a Time becomes so much more than a cliche (if it ever was one). Eventually Jacques remarkable energy waned and it was time to leave. We promised to send postcards from British Columbia. Louise said jacques' only regret is that he never saw the coast of British Columbia. jacques echoed that a few minutes later - and paused...then admitted if that was his only regret it wasn't too bad. We kissed goodbye, and told each other 'I love you.' And made it out into the hall before bursting into tears. It was a beautiful three hours. jut got out of the pool - refreshing. Sat in the chaise lounge and stared at the clouds. So peaceful. Most of today, though, has been running around getting ready to head out tomorrow morning. Our friends the Mounts will be moving over from the guest cottage to stay here - so we realized it might be nice if they not only had clean sheets and towels, but space in the closets and bureaus and medicine cabinets. Oh my. fortunately, Deanna's coming tomorrow morning to do the actual cleaning....we're just doing the laundry and some organizing,,, and packing ourselves, of course. Fun to have them over for a barbeque. Their friend, Trevor Pinnock, is with them. He's a conductor, specializing in Bach. Lots of recordings, lots of concerts. He's at the guest cottage right now going over a score...he's writing an article on the Unfinish Symphony. I'm sure our thoughts on it over dinner will be illuminating. Or something. Linda, Bethany and I are heading out in a few minutes. I thought it would be fun if the girls had afternoon tea togther, then we'll come back for a swim, cocktails and dinner. Woke up to the absurdly wonderful news that BURY YOUR DEAD has received an extremely rare fourth starred review - it's from Publisher's Weekly. There are 4 pre-publication journals that are extremely influential. They're the first to read a book, before it comes out...and their thoughts often set the tone of how a book will be received. All my others have received starred reviews from 3 of the 4 - but this is the first time all four have given a book starred reviews. It's extremely rare in publishing and I'm over the moon. At the start of Agatha-winner Penny's moving and powerful sixth Chief Insp. Armand Gamache mystery (after 2009's The Brutal Telling), Gamache is recovering from a physical and emotional trauma, the exact nature of which isn't immediately disclosed, in Québec City. When the body of Augustin Renaud, an eccentric who'd spent his life searching for the burial site of Samuel de Champlain, Québec's founder, turns up in the basement of the Literary and Historical Society, Gamache reluctantly gets involved in the murder inquiry.... Few writers in any genre can match Penny's ability to combine heartbreak and hope in the same scene. Increasingly ambitious in her plotting, she continues to create characters readers would want to meet in real life. Yipppee! (that's my yippee, not PW's) A great day - starting with the news of the fourth star, and ending with dinner with great friends. How kind life can be. On the other end of it, Michael and I are heading to Granby tomorrow morning, to see jacques and Louise. We have no idea what the future holds, but it seems that for Jacques, it is shorter than he'd hoped. But as I mentioned yesterday, he's a peace, and in palliative care. oddly, Bal Mount, one of our guests tonight, is the doctor who created Palliatve Care in North America. We're looking forward to thanking him. But it will be difficult, of course, to leave Jacques tomorrow. And say goodbye. Though we all cross that river. Well, phew. Yesterday was the SPCA Tea. It was wonderful - thanks, as always, to a huge amount of work by a huge number of volunteers. Congratulations to everyone who helped! And wow, did they work hard! I have to say, My Assistant Lise and her wonderful husband Del saved the day more than once. We needed elecricity out by the pond where the two tents were placed. We needed it for the tea and coffee. Well, most of the plugs didn't work, and the one that did blew a fuse. So everything was tepid, people were pouring up the drive way, and we had no electricity, by the pond or in the refrigerator in the mudroom. Del kept plugging extension cords in and finally found one that worked, just in time. Phew. Lise spent much of the tea up to her elbows in suds, washing tea cups because we were going through them so fast. But there were really three stars at the event: Lise and her gardens, Trudy - who was fun, and gentle and welcoming - and the four dogs the SPCA brought, most of them saved from puppy mills. We were all exhausted at the end of the day...just wrung out. And then came the total. We were all hoping to raise 10,000 dollars for medical equipment for the local SPCA Monteregie, a no-kill shelter. We all ended up making more than 12-thousand!!! A couple of friends, Sharman and Walter, came down from Montreal and stayed the night. We went out to a local italian restaurant, Il Duetto, for dinner. And nose down in the pillows by 10am. This morning people began arriving to take things away. Oh, did I tell you, we got to talking to the fellow who delivered the Port-a-Potty and it turns out he spent 30 years as a pilot for private corporate jets. And now he drives toilets all over the townships, and loves it. You just never know who you're going to meet, and what people's backgrounds are. We spent a couple of lovely, peaceful hours on the porch this morning with Sharman and Walter, drinking coffee and having breakfast - then into Brome Lake Books in Knowlton and lunch at the Cafe Inn with the two of them. Then waved goodbye, and headed home in the beetle, top down. And now doing laundry and preparing to leave on the mini-tour. Our friend in Granby is very ill. Now in palliative care. Had a call at 6 this morning from his wife and we chatted. Then she called back a few minutes later and we chatted some more. We're going to see him Tuesday morning. Louise, our friend, said they stayed up all night talking - and she had a chance to tell him all the things she wanted to say, and to thank him. And he had a chance to tell her how grateful he is to have spent his life with her. How sorry he is to be leaving her so soon. And that he's a peace. Remarkable people. We're also at peace, losing a precious friend. How lucky we are to have him now. And to have known him for as long as we did.